The project “Building resilience in the Greater uMngeni Catchment, South Africa” (US$7 495 055) aims to increase resilience of vulnerable communities through interventions such as early warning systems, climate-smart agriculture and climate proofing settlements. This project will be led by the uMgungundlovu District Municipality. 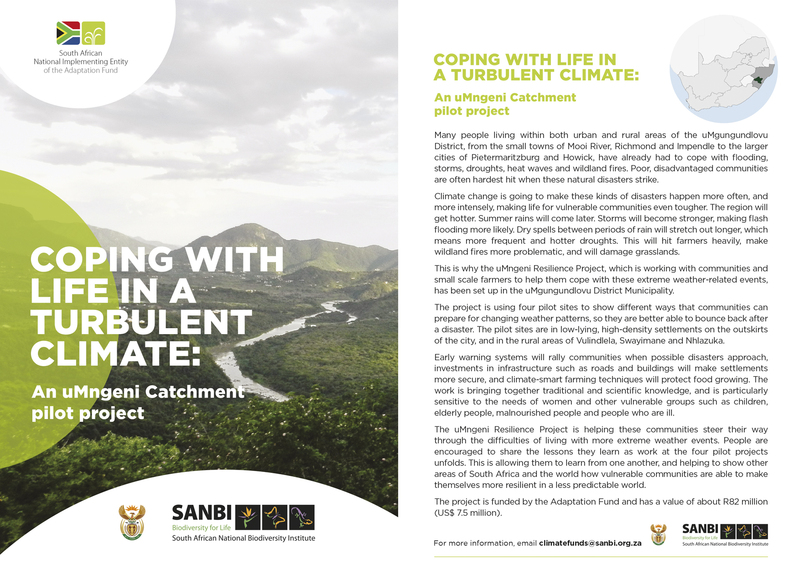 The full project proposal submitted to and approved by the Adaptation Fund for the uMngeni Resilience Project is available here, and the supporting annex document here. Many people living within both urban and rural areas of the uMgungundlovu District, from the small towns of Mooi River, Richmond and Impendle to the larger cities of Pietermaritzburg and Howick, have already had to cope with flooding, storms, droughts, heat waves and wildland fires. Poor, disadvantaged communities are often hardest hit when these natural disasters strike. Climate change is going to make these kinds of disasters happen more often, and more intensely, making life for vulnerable communities even tougher. The region will get hotter. Summer rains will come later. Storms will become stronger, making flash flooding more likely. Dry spells between periods of rain will stretch out longer, which means more frequent and hotter droughts. This will hit farmers heavily, make wildland fires more problematic and damage grasslands. This is why the uMngeni Resilience Project, which will work with communities and small scale farmers to help them cope with these extreme weather-related events, has been set up in the uMgungundlovu District Municipality. The project will use four pilot sites to show different ways that communities can prepare for changing weather patterns, so they are better able to bounce back after a disaster. The pilot sites are in low-lying, high-density settlements on the outskirts of the city, and in the rural areas of Vulindlela, Swayimane and Nhlazuka. Early warning systems will rally communities when possible disasters approach, investments in infrastructure such as roads and buildings will make settlements more secure, and climate-smart farming techniques will protect food growing. The work will bring together traditional and scientific knowledge, and will be particularly sensitive to the needs of women and other vulnerable groups such as children, elderly people, malnourished people and people who are ill. The uMngeni Resilience Project will help these communities steer their way through the difficulties of living with more extreme weather events. People will be encouraged to share the lessons they learn as the four pilot projects unfold. This will allow them to learn from one another, and can help show other areas of South Africa and the world how vulnerable communities are able to make themselves more resilient in a less predictable world. The project has a value of about R82 m (US$7.5 m). These include the studies that were undertaken as part of the Long Term Adaptation Scenarios process and climate change vulnerability work that was undertaken for the uMgungundlovu District Municipality.